Jeremiah Farrell's fascination with puzzles started early, around age 12. 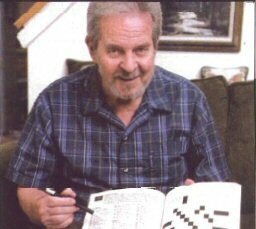 Even now, as a professor emeritus in mathematics at Butler University, Jerry works four or five crosswords a day. "I do every puzzle I see. I've been doing this all my life," he says. "It's very satisfying and very entertaining, and it requires no batteries." But he doesn't just solve crosswords. He writes them, too. Thanks to the recent Wordplay book and movie, he's perhaps best known for his 1996 Clinton-Dole election crossword that appeared in a November New York Times. Multiple correct answers for the down clues enabled solvers to fill in either "CLINTON ELECTED" or "BOBDOLE ELECTED" in the 14-letter spaces at the center of the crossword. And the main clue? "Lead story in tomorrow's newspaper"! Though technically retired, Farrell still teaches mathematics and a special course on games, and he's active in the annual International Puzzle Party, the Games and Puzzles Organization, and the Gathering for Gardneran invitation-only group of the most avid puzzlers and admirers of the writings of Martin Gardner. Why is his mind always seeking puzzles to solve? That's one he hasn't cracked yet. "You see these things, and it's like someone waving a red flag or something," he says. "Why do you climb Mt. Everest? Just because it's there." Jerry commissioned Kadon to make him a number of "Bullfrog" puzzles and special designs for the International Puzzle Party. His creativity never stops. We're very happy to have received permission to develop and produce his Chasing Squares design. It never ceases to surprise us with new and beautiful discoveries.